It is a cereal grain, the seed of a grass called Avena Sativa. It's not as bad as wheat but worse than rice, it falls somewhere in the middle. And when I say the word 'bad' I mean what effects it has on the body, and in this case, the gut and digestive system. Since oats are a grain, you know it comes with grain's antinutrient goodies like Phytic Acid and its own form of Gluten called Avenin, which causes a lot of problems for a lot of people. Phytic Acid is a problem because it binds important minerals like zinc, calcium, magnesium, iron, and shuttles them out of the digestive tract instead of being absorbed into our system. So even though oats may have a descent vitamin and mineral profile they're not getting where they need to go. Not a good thing, one strike against oats. Also, being a grain relative of wheat, barley, rye, and possessing its own prolamine protein called Avenin, it promotes intestinal permeability, letting all sorts of nasty stuff into circulation and all of the systemic autoimmune conditions this brings to the table. That's really bad, strike two. So then, why is oatmeal touted as heart and cholesterol healthy? Lets look at the claims. Oatmeal contains Fiber but vegetables and fruit completely dwarf the bland tasting oat, so why bother? Oatmeal Lowers Cholesterol. True, the beta-glucan in oats stimulates the release of bile. Bile is full of necessary cholesterol to aid in digestion and evacuation will obviously show a lower total count of LDL. But remember, we need cholesterol. Cholesterol is not bad! It is essential for digestion and a host of other essential bodily functions like hormone manufacture, Vitamin D manufacture, tissue repair, etc. 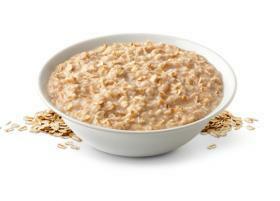 Cholesterol is not a bad thing and just because oatmeal purges the gall bladder means nothing. Oatmeal Prevents Atherosclerosis. Well, no. Preventing Systemic Inflammation prevents atherosclerosis. Avoiding grains, sugars, and other cheap refined carbohydrates that promote swelling of tissue, including arteries where stuff will get stuck prevents atherosclerosis. So, there you have it. Another tangle with a supposed healthy food. This one, bland and more bland. Sorry! A grain is a grain is a grain. So I get a lot of questions on oatmeal. People seem to love it for some strange reason, and really, I dont know why because it's bland and takes a lot of dressing up (brown sugar, cream, fruit, salt, honey, etc.) just to make it edible. Maybe it's a comforting childhood memory of a warm bowl of oatmeal at the kitchen table on a cold winters morning surrounded by family, I don't know. But, here are the facts about oatmeal.